Bake me a picture: Part 2 ... It's finished! After many hours work, I had the finished product! Ta da! I realise that the tower at the back is ahem, a little bit wonky, however, happily I have learned a few things from this adventure. Namely, I probably should have used something like a swiss roll to make the tower as it might have been straight! Or if not that, then I should have rethought the layering etc. 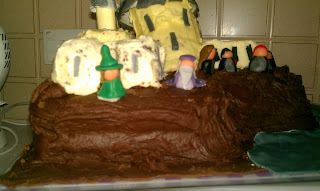 The base was made of two layers of chocolate sponge, held together with a filling of chocolate buttercream. I cut a corner off of the cake and gave it some jagged cliff type edges. This was done very roughly, as when I coated it with chocolate fudge icing, which was nice and thick, gave additional rocky texture. I then stuck some decorative blobs around the place to make a few more "rocks" (which my boyfriend decided he should even out by trying to pick them off and eat them, before the cake was given to the birhtday girl!!). Once this was in place I made 2 layers of vanilla sponge using an 8" circular tin, from which I cut several layers using an upended mug, for the tower at the back (this used all of one of the layers, bar the various off cuts). The first was iced at the bottom then placed on the base. I then layered them by adding buttercream on top, then iced around the edge of each piece as I added it .... I would suggest NOT following this method to create something tall and circular, everytime I added a piece it all slid and the buttercream was gently sinking towards the bottom, so the tower was wider there. It gave a fun, oldy rustic look, but could also have been described as a bit crap. I would suggest only a very small amount of buttercream in the middle of each layer to hold them together, to layer larger pieces than you will need, then use something like a cookie cutter to get the whole lot to the right size together. 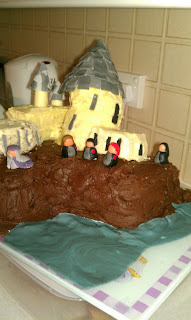 You can then place the uniced tower on the base and add the vanilla buttercream icing all around the tower. 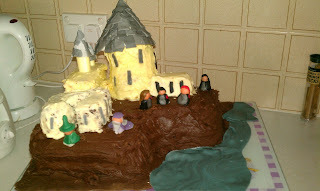 The remaining base sections were made up of two layers of sponge and also iced with vanilla buttercream. 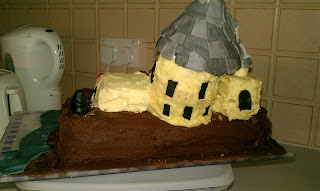 The windows and other similar details were made up of black or grey fondant, rolled and cut to the correct shapes. 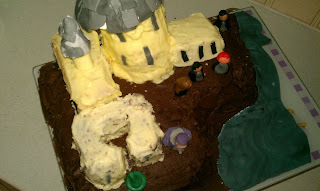 The turret tops were made of card with fondant added ... there is no way that back tower could have held any more cake! Copious numbers of straws and other reinforcements were already used to try to keep what was already there in place. The tiles were simply roughly rolled out fondant cut into squares/rectangles with no real finesse at that point (curved edges etc around the edge of the rolled section were left as they were). The turret top was created from a circle of card with a slit, curled around to make a cone. A thin layer of buttercream was then put all over the card, and working from the bottom up, I simply covered the whole thing with the "tiles" a layer at a time, each higher layer overlapping a little with the one below. 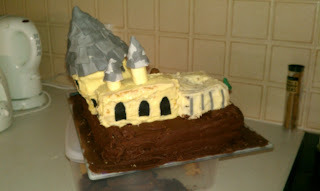 The two turrets on top of the great hall, were also made completely from card and fondant. The roofs were made in the same way as the larger one, and the turret bodies were made from small card tubes covered with fondant which had been coloured to match the buttercream. 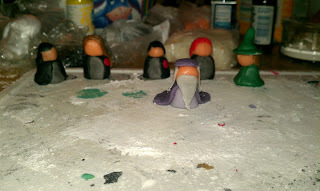 Once this was all done, I placed all of my little pre-made characters in various locations around the castle. And the final part, was to add the lake to the cut away area. Here I took some blue fondant, and added a very small amount of black fondant, mixing the two gently until they gave a marbled effect, but before the whole thing went completely grey. I then rolled this out and placed it to fit around the bottom of the base, trimming and moving the off-cuts to better locations as I felt was necessary. My top tip, would definitely be, use cornflour to stop your fondant sticking, it is so very very much easier when you aren't trying to transfer fondant that is completely stuck to something! I had a great time making this, and when presented with it, the birthday girl was very happy with her cake. I hope you have enjoyed reading about it! I will make my next cake creation in a few weeks, all suggestions for themes and ideas are welcome.